Bet Jaguars +3.5 over Eagles with Karamba. Bet Eagles-Jaguars under 42 with 888Sport. Bet Eagles first to score at -143 with 888Sport. After blowing a 17-point lead in the fourth quarter Sunday to the Panthers, the Eagles (3-4) have the feel of an aimless ship. All of their issues from a disappointing 3-3 start manifested in the final 15 minutes against Carolina – abandoning of the run, a lack of blitzing and the secondary again exploited by the short passing game. The defending Super Bowl champs just haven’t shown consistency in execution the way last year’s team did. The offense ranks 22nd in point scored despite Carson Wentz’s 108.1 passer rating. The defense ranks sixth in points allowed but routinely allows game-changing pass plays. Every week someone lands on injured reserve. Even so, the Eagles are just one game out of the NFC East lead with five division still remaining. 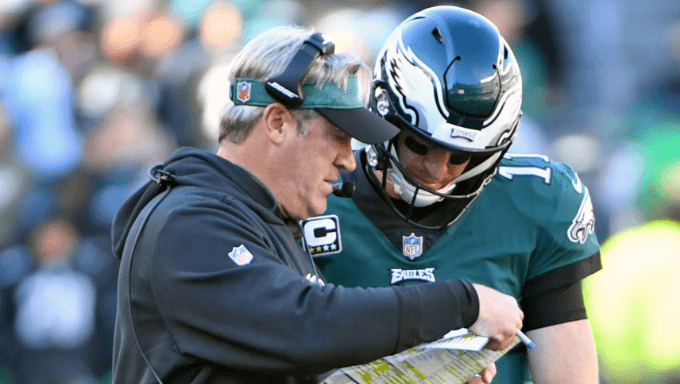 With Wentz playing like an elite quarterback there’s always a chance for them to start a run. The Jaguars (3-4) are spiraling downward and need a life-preserving win Sunday at Wembley Stadium, their home away from home. The defending AFC runner-ups have lost three straight and four of five after opening their season with wins over the Giants and Patriots. The Jaguars are the only NFL team with at least three wins that has a scoring margin of at least minus-30. Beleaguered quarterback Blake Bortles was benched last Sunday in a 20-7 loss to the Texans that followed a 40-7 drubbing to the Cowboys. Bortles is one of the league’s lowest-rated starting quarterbacks (80.3) and enters the game with a short leash. Jacksonville’s defense is ranked ninth overall but the Jags have still lost their last three games by an average of nearly 21 points. Eagles defensive end Derek Barnett (torn shoulder) is the latest to land on injured reserve, joining starters Mike Wallace, Rodney McLeod, Jay Ajayi and Tim Jernigan. The Eagles are deep on the D-line, their strongest position, but losing Barnett, the 14th overall pick from 2017, is a big blow. His injury puts Michael Bennett back into a starting role and opens the door for impressive rookie Josh Sweat to get more rotational time. Running back Darren Sproles is still sidelined with a hamstring injury that’s sidelined him since the season opener. Carries will continue to be split between Corey Clement and Wendell Smallwood, with rookie Josh Adams sprinkled in. The Jags clearly aren’t the same without running back Leonard Fournette, who’s been out since Week 2 with a severe hamstring strain and isn’t expected back Sunday. The team acquired veteran Carlos Hyde via trade with the Browns to boost their 23rd ranked rushing offense. Hyde should debut against the Eagles. He’s not in Fournette’s echelon but Hyde can move the chains. Defensive end Calais Campbell, a major part of the team’s pass rush, was limited in practice this week from ankle and hip injuries. 888Sport has the Jaguars as a 3.5-point underdog. The Jags have won three straight in London after an 0-2 start at Wembley, all with Blake Bortles as the starter. Jacksonville has averaged 36 points per game in those wins, which illustrates a stark difference in offensive production when Bortles plays across the pond compared to his production on American soil. The Eagles have never played in London. This will be their first experience with international travel and preparing for an overseas game. None of this will probably turn the Jags into an overnight scoring machine, but history suggests the Jags will put up much more of a challenge at Wembley than they would in Jacksonville. Take Jacksonville and the points with 888Sport. Karamba has the over/under at 42 because neither team is to be trusted offensively. The Jags are averaging fewer than 10 points in their past three games and there’s no indication that the offense will fare much better against the Eagles’ ninth-ranked defense, even with Hyde joining the fold and even on Wembley’s fast track. The Eagles have sustained long drives and lead the NFL in time of possession but are middle of the pack on third down and in the red zone. They’ve also struggled in the kicking game. None of the Jaguars’ receivers are averaging more than 14.8 yards per catch, so it’s hard to see Jacksonville making enough big plays to dent the scoreboard. Even if they can dink and dunk, the Jags have the fourth-worst red zone offense and the Eagles are ranked fourth in red-zone defense. For those reasons, play under 42 with Karamba. If they win the coin toss, the Eagles usually defer and put the opposing offense on the field. The Jags offense has hit the skids lately and hasn’t scored on an opening drive or in the first half in each of its past three games. The Eagles are most vulnerable to long pass plays but the Jags have just five pass plays all year of longer than 20 yards in the first quarter, and just two in the past four weeks. The Jags have made one first down on their opening drive in the past three games. The Eagles, meanwhile, have scored first in each of the past two games – both on touchdowns, one on the game-opening drive. They’re already favored to win and performing much better offensively and defensively over the past three weeks than Jacksonville has. Take the Eagles to score first at -143 with 888Sport.